The Whitechapel district of London’s East End in the latter decades of the 19th century was a popular place for immigrants and the poor working class. During the late summer and fall of 1888 its foggy lanes became the nighttime hunting ground of one of history’s most notorious serial killers, Jack the Ripper. No woman was safe. Flower girl Constance Piper is not immune to dread, but she is more preoccupied with her own strange experiences of late. Clairvoyants seem to be everywhere these days. But are such powers real? And could Constance really be possessed of second sight? She longs for the wise counsel of her mentor and champion of the poor, Emily Tindall, but the kind missionary has gone missing. Following the latest grisly discovery, Constance is contacted by a high-born lady of means who fears the victim may be her missing sister. She implores Constance to use her clairvoyance to help solve the crime, which the press is calling "the Whitechapel Mystery," attributing the murder to Jack the Ripper. As Constance becomes embroiled in intrigue far more sinister than she could have imagined, assistance comes in a startling manner that profoundly challenges her assumptions about the nature of reality. She'll need all the help she can get—because there may be more than one depraved killer out there. Tessa Harris is the acclaimed author of the Dr. Thomas Silkstone Mysteries, which includes Secrets in the Stones and The Anatomist’s Apprentice. In her new novel, The Sixth Victim, Harris delves into “Ripper” lore with the first rendering of the Constance Piper Mystery series. The novel is set in 1888 as Jack the Ripper has just begun his reign of terror. The storyline alternates between two perspectives, Constance’s and Emily’s. Constance lives in Whitechapel and comes from a poor family; she and her sister make money by stealing from the rich. Emily Tindall is from a good background; she is a Sunday school teacher and has taken Constance under her wing, teaching her to read and showing her a life far removed from her own. Although The Sixth Victim shadows the murders of Jack the Ripper, the main story is Constance’s search for Emily who seems to have gone missing and how her psychic abilities slowly, and much to her astonishment, grow. Constance is also approached by a lady from the upper classes who fears her sister has been victim of the “Ripper.” The lady asks for Constance’s help in solving the mystery. With The Sixth Victim, Harris has managed to create a very colorful and sometimes horrifying image of Whitechapel, showing a stark distinction between the lives of the less-fortunate residents of London’s East End to that of the more well-to-do who live in the grand houses and hotels of London. It was easy to imagine the sights and sounds of the area and understand why the women of that time lived in constant fear. 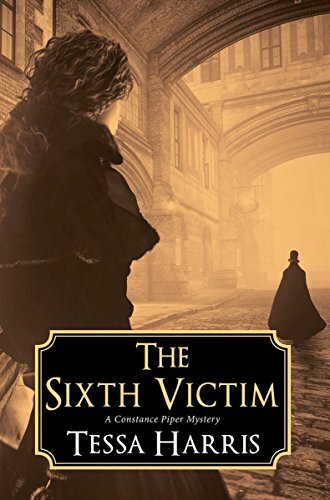 Overall, The Sixth Victim is well written and will most definitely satisfy readers who enjoy historical fiction and murder mystery. Be warned, if you aren’t into gory descriptions of Ripper style murders this probably isn’t the book for you. In general, the characters have significant layers of complexity and humor. They are well formed and realistic, and the plot comes together in a logical manner. Constance, the main character, is courageous, moral, curious, and keen to better herself. She’s an amateur sleuth with psychic capabilities who has lots of potential to carry the series forward.